I'm taking an online class called Holiday Style, and enjoying every minute of it! I'm always slow with the homework, but as I didn't work today, I had some time to play with my inks and stamps, and I want to share my card with you all, (I imagine most of us are frantically creating Christmas cards). So, on day 2 of class the teachers gave us lots of beautiful inspiration on clean and simple cards. Mine was inspired by this card by Kristina Werner. So here you have it. If I have to make this card again I would use a white or silver embossing powder for the sentiment to create a better contrast. I used distress inks for the background and then spritzed water with perfect pearls and it gave a beautiful shimmer to it. 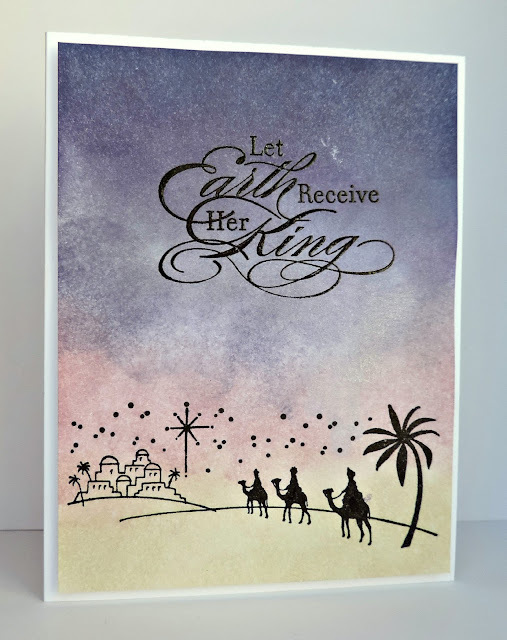 The sentiment is by Stampin Up! and the main image is by Stampendous. Thanks for visiting, have a blessed rest of the week. What a beautiful scene! Your color-blending looks awesome... Great choice of colores! Oh, I think this card is fantastic. Though it may take you a bit to get to the class, it appears you might be an A student. Lovely, lovely card, Loly. Very pretty. The background turned out awesome. What a wonderful card, Loly! Next year I need to take another class--always so inspiring! Hope you had a Merry Christmas!